With all the stress and sadness of the last few months, I had almost forgotten my main New Year's resolution for 2010: to fill my life with as much children's book-related joy and fun as possible, and, while I was at it, to fill my life more generally with as much joy and fun as possible, period. I am now seriously behind on fun, and it is time to get serious about remedying the situation. I am going to hike daily on the mountain trails by my home with my friend Rowan. I am going to go to the farmers' market on Saturday mornings and buy healthy fresh-grown food to eat. I am going to read books just because I want to read them. My dear friend Rachel is going to visit from Virginia. I'm going to go with her and Rowan to the Colorado Book Awards in Aspen, where How Oliver Olson Changed the World is a finalist in the juvenile fiction category. I'm going to go to New York/New Jersey with the boys to visit my sister and maybe have lunch with an editor or with my agent. I'll have my summer retreat up at Lake Dillon with my writing group. I'll go to half a dozen Colorado Music Festival concerts up at Chautauqua with my friend Diane. Oh, and I hope I'll get comps for the Colorado Shakespeare Festival, in exchange for letting them use my Hellems Hall office as a dressing room. So I'd better get busy. Fun awaits! First, dear friends and readers, thank you for your kind words about my mother. I have been overwhelmed (in a good way) with so much love and support and comfort from everyone that I could spend the rest of my life just counting how blessed I am to have such wonderful friends. And now life goes on. The boys and I are heading to New Jersey the end of next month to place my mother's ashes in the beautiful garden at Wilson Memorial Church in Watchung, New Jersey, where we all placed my father's ashes 23 years ago. As my sister bought our childhood home in North Plainfield, New Jersey, a couple of years ago, it will also be a chance for the boys to see where we grew up and for us all to share more childhood stories and memories. Although I miss my mother so keenly throughout every day, and can hardly believe I can't share with her every detail about Gregory's high school graduation last weekend, my dominant emotion right now is gratitude that my mother's life was so filled with the joys of reading, writing, and family, that her long ordeal is now over, and that it ended so peacefully and lovingly. And I'm sort of excited about the rest of my life, taking up all the projects I've neglected for the past weeks and months. I have a paper to write for a volume commemorating the 100th anniversary of the publication of The Secret Garden (a paper that is due tomorrow! ), and a paper to write for the Children's Literature Association conference next week in Ann Arbor (on Rosamund Du Jardin's 1950s teen romance trilogy: Double Date, Double Feature, and Double Wedding). I have a book of my own to revise. I have trails to walk on, a pool to sit by, friends who are overdue for tea and treats, a cat to cuddle, trips to plan. I wish I could tell my mother about all of them. But I think she already knows. My mother died yesterday. My sister and I were with her, sitting by her side, holding her hand. My mother is the reason I became a writer. When I was six years old, she gave me one of those marble composition notebooks and told me that it was to be my poetry writing notebook. So I started writing poetry. What else could I do? My mother hated to spend money, but our house was always filled with books: library books from the biweekly pilgrimage we made to the public library every other Saturday morning without fail; free sample books that we got every year when we went with her to the New Jersey teachers' convention in Atlantic City and cruised the aisles of the convention hall for examination copies of Catcher in the Rye and Anna Karenina. My mother gave us summer writing projects. The most arduous was our massive Sturbridge Village report, which we were required to make after our family vacation to the colonial village in Massachusetts - complete with a story, assigned to us by our mother, written in the voice of an 18th century girl. I did not feel more relief upon defending my doctoral dissertation than I did after finishing my Sturbridge Village report. My mother was a published writer herself: of articles for Instructor magazine, of children's stories for Humpty-Dumpty and Jack and Jill, and in her later years, of exquisite letters to the Boulder Daily Camera - vignettes of life in Boulder and warm commentary on articles in the paper. I found dozens of the letters - each one typed on her manual typewriter with carbon paper, so she'd keep a copy, with the published letter paper-clipped to it - when Cheryl and I went through her files this week. My mother was so proud of my career as a writer. She loved to come to my book signings and buy multiple copies of my books, even though of course I would have given her as many as she wanted for free. When each of my books was published, she was always convinced that THIS one would win the Newbery. She was always wrong about that, of course, but I have to say that she wasn't wrong about much else. She was a keen and wry observer of human nature, quick to detect faults and flaws, but equally quick with her lavish appreciation. And now I have to try to imagine what life will be without her. My sister, Cheryl, is visiting me this week from New Jersey. We are spending a lot of time with my mother, sorting through old family photos and memorabilia that my mother saved through all her moves: our baby bracelets from the hospital in Astoria, Queens, where we were born, 361 days apart; childhood photos of us, ALWAYS in matching dresses, as we wore matching dresses every single day of our lives until we finally rebelled in junior high school; our prize certificates from the "Friendship 7" summer reading club at the North Plainfield, New Jersey, public library, where, according to our certificates, we each read 100 books "of literary merit"; all of our elementary school report cards; two little matching cardboard boxes, one labeled CLAUDIA and one labeled CHERYL, each containing a teensy-weensy porcelain tea set; our Christmas stockings, hand-knit by our mother, each one bearing our name. It's been a few days of intense reminiscing , sharing all the memories that no one else in the world has except for the two of us. Then, in the evening, to unwind, we've been watching a couple of episodes each night from season one of The Patty Duke Show, one of our childhood favorites. 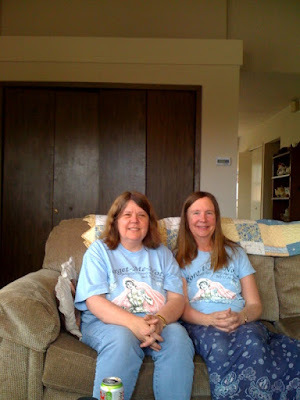 We don't wear matching clothes any more, but do happen to have matching T-shirts from the Betsy-Tacy convention we attended together last summer in Mankato, Minnesota, another sisters' outing we will always treasure. Cheryl brought hers with her on the trip, and I found mine to wear today, as well. As predicted, the rain turned to snow, and by morning Boulder had perhaps five inches of it: five extremely heavy, wet inches. As I drove Gregory to school, and then as I walked to the Skip stop to head off to work, I saw tree after tree with broken branches. Already laden with their abundant spring blossoms, they were unable to bear the additional crushing load of snow, and so their once-majestic branches snapped and now hung low, dragging on the snowy ground. I tried to liberate as many branches as I could, shaking each one gently for the joy of watching it spring back up again. But the extent of the devastation was beyond any one individual's ability to affect in any significant way. As always happens with such heavy spring snows, and we do get them every single year, it started to seem impossible that any flowering trees can grow here in Colorado. But you know what? They do. Next spring, the lost limbs from this spring's snow will be cleared away, and the trees will be back in bloom, as beautiful as ever, decked out in radiant pink and white. Their beauty will be staggering, unmarred. It will take my breath away. Do you remember the song "Cold Kentucky Rain" by Elvis? I'm thinking about it tonight, because we're having a cold Colorado rain which will shortly turn to cold Colorado snow - in the middle of May! I love that song - the lover trudging through the cold Kentucky rain to find the woman who left him "seven lonely days and a dozen towns ago," searching for her in the cold Kentucky rain, in the cold Kentucky rain. I love the alliteration of "cold" and "Kentucky" - and the rhythm of it - so much better than cold Michigan rain, or cold North Dakota rain, or cold Kansas rain. I can't think of any rain colder, or more bleak and hopeless, than the cold Kentucky rain. All of that in just three words. It helps that one of them is a place name. Place names carry extra weight, because they have so many associations that overlay them. And yet, when it comes to cold Kentucky rain, all I really have as an image to go with Kentucky is the Kentucky derby, and "my old Kentucky home" - though maybe the plaintiveness of "my old Kentucky home" is at work here as well. Kentucky doesn't feel like an up-and-coming state, but a has-been or never-was state, where people live in old Kentucky homes and run old Kentucky races. Abe Lincoln was born in a log cabin in Kentucky - and left the state forever. Kentucky bluegrass grows in Kentucky - empty expanses of nothing but grass. That's it for what I can associate off the top of my head with Kentucky. But it's enough for that cold Kentucky rain to keep on falling, the cold Kentucky rain, the cold Kentucky rain. Everyone I know, just about, is having a terribly hard time right now, for one reason or another. In every direction that I look I see sadness, ranging from mild discontent to complete life meltdowns. I don't even watch any news, because I know it will be sad news. Sadness, sadness, everywhere. I'm tempted to wallow in it, to dwell on the sad details of every sad story. Part of me feels that I ought to wallow, that it is part of my duty as a friend and family member to feel my loved ones' pain, and that the more I love them, the more keenly I should be feeling their pain and the more fully I should be sharing their sorrow. I heard a good sermon recently about grief, which said that sometimes we just have to drink the cup of grief down to the last drop of tears in it. So maybe I should keep on drinking. But then I remembered a story I heard once about comedian Bob Hope, who was entertaining wounded soldiers in a military hospital overseas; the gorgeous actress who was performing with him became overcome with the pain that she was witnessing, and started to cry in sympathy with the hideous injuries of the patients there. Bob Hope rebuked her: "We aren't here to cry with them, we're here to make them laugh," he told her. So part of me feels that the best gift I can give my suffering loved ones is to try to be one little island of hope and happiness in their sea of sadness, the one person who right now isn't falling apart, or at least isn't falling apart THIS AFTERNOON. So maybe I should try to go out and do at least one cheerful and constructive thing to make somebody else's life less sad. But first I'll wallow a little bit longer. I had such fun with the kids today at Ida Freeman Elementary. They even wrote me appreciation poems afterwards. Here is the poem written together by Linda Skinner's 4th grade enrichment class. Note how it spells out my name. Unique for her "Ape Dance"
Dancing gave her the nick-name "Tarzan"
Mouth . . . "Writing can be hazardous!" Swiss Miss hot chocolate and WRITE! The fifth grade enrichment class wrote their own individual poems spelling out either "CLAUDIA MILLS" or "THANK YOU." They were encouraged to use the thesaurus to get unusual words. I wish I could post them all, but here are a few. Careful and awesome writer YOU are! Lots and lots of fabulous dissertations you wrote! Ape dance was excellent thank you for showing us! Determination made you keep writing and not quit! Intelligent, smart and a great author you are!! Always entertaining us with all the books YOU write! Marvelous work impossible to make better!! Laughter is what your stories have! Swiss Miss hot chocolate helps you think. How do you like your novels? A novel idea for a main character is a cucumber. Nobody's novels are as incredible as yours. Ky can be the cucumber's name. Other writers are not as amazing as you. "U" are my favorite writer. Talk about an interesting Author! Had a great time listening to your stories. Ape Dances are more hysterical than embarrassing. Nothing is more funny than 7 x 9 = Trouble! Kittens could be your new main characters! Years and years of writing sure pay off! Over the years everyone has loved your books! Underneath every single of your novels is an experience. Crazy author came to our school. Laughable author was so funny. Aesthetic author makes me want to write. Unbroken you are very happy. Display a good role model. I feel wrong for you with your rejections. My gosh you are wonderful. I hope you make more books. Lazy is not your thing. Swiss hot cocoa sounds good. I say, Ida Freeman Elementary, YOU rock! After a whirlwind weekend at home, I'm back in Edmond, Oklahoma, to do a few more days of school visits, returning home later this week to a huge stack of grading and the fun of commencement at CU. "How many books have you wrote?" Answer: "I have published 42 books, but I have a whole carton in my garage filled with books that I wrote that never were good enough to be published." "What is your favorite book that you wrote?" Answer: "That is like asking a mom, what is your favorite kid that you had? Each book has a huge chunk of my heart in it." Answer: "I was born on August 21, 1954. You do the subtraction!" "What do you do when you're stuck in the middle of a book?" Answer: "Just keep writing, knowing that it's fine and expected to throw much of what you write away." "How do you know when you're done?" Answer: "I have my friends read my drafts and let them tell me." One third grader once asked me, "Which review media do you find most helpful, Booklist, Kirkus, or School Library Journal?" I'll have to see what I'm asked tomorrow.